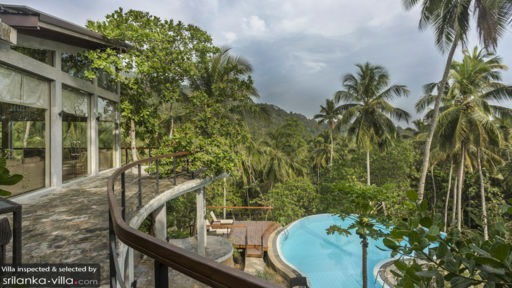 A holiday home where you can make your own organic coconut oil with an eco-friendly pressing facility, help to milk the cows, and tend to horses? Yes, please. 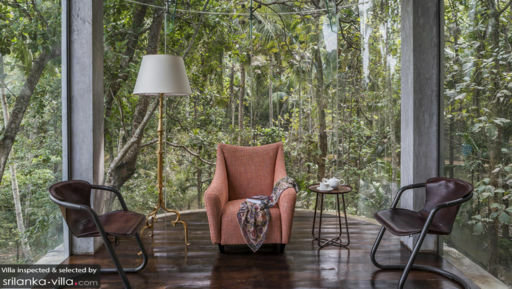 The Far Pavilion as part of the many boutique villas offered by Edwards Collection, is a two-bedroom villa located amidst the serene mountainside of Pinnawala, Sri Lanka surrounded by lush forests and set amidst 90 acres of private coconut plantations. The villa is part of a working farm so guests can even participate in the daily activities. The interiors are as luxurious as the outdoors, with rich Indian heritage and Western décor taking centre stage. The stupendous beauty of the two bedrooms at The Far Pavilion comes through its larger than life display of fine craftsmanship, traditional patterns, and stunning design. Standing in the centre on hardwood floors, the majestic king bed of the master bedroom is draped with the best quality linen, while the four posters are metallic and exuberant. The glass walls allow an unobstructed view of nature that are ornamental to say the least. The suite leads to a gracious lounge and study with a desk, leather chairs, and surrounding views. The second bedroom is found upstairs with an attached balcony providing resplendent views, a super comfortable king bed, a private corner seating, and a slanted ceiling. There is a vintage and antique study desk as well. Both bedrooms are air-conditioned with ensuite bathrooms that are equally luxurious with outdoor bathtubs for an immersive experience. The villa is inspired by the famous 20th-century novel by M.M. Kaye of the same name. To embody a sense of detachment from busy city streets and throngs of crowds, away from it all amid the calming mountains, the villa has been built within a luscious, dense and natural setting. The house stands tall amid coconut trees that tower over its private swimming pool, it is a tropical holiday home after all. There is a raised pool deck beside the pool with sunbeds to relax on. A terrace with alfresco dining and outdoor seating is also accessible. 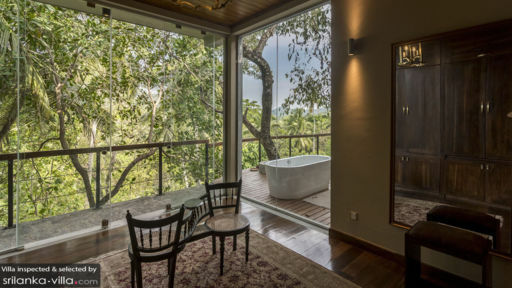 A feature that sets The Far Pavilion apart from other villas is its glass-plated walls that run on both floors to never hinder your view of the extravagant and verdant mountainside. There is more than one communal area or a cosy nook with leather chairs or sofas where you can retreat to for a relaxed afternoon and lazy summer’s evening. Designed in the most luxurious and opulent way possible, you will find rich tapestries, jewel-toned textiles, plush seating, and a remarkable antique daybed. Vintage lamps cast a warm glow across the room once the sun sets and you can even make use of the work-desk which has an iMac, a modern contrast to the traditional interiors of the room. You can choose to dine either outdoors or indoors where there is ample seating for guests to enjoy a scrumptious feast prepared by the staff using free range and organic produce. A vast selection of artwork graces the walls while Indian textiles drape the hardwood floors. Live in the lap of luxury at The Far Pavilion where the staff will serve you with pleasure and the best part is that you can help out around the farms as well. Enjoy your escape to the villa library or relax on the while relishing a delicious breakfast terrace as the house is duly managed by the staff. The estate is self-sufficient and it will be days before you familiarise yourself with its vastness. Head to the nearby elephant orphanage in Pinnawala to see how these majestic beauties are taken care of. There is a lot of activities to engage in around the property itself so you will never get bored at The Far Pavilion.